Zip-line | Batta bing, batta blog! A few weeks ago we went to Mexico. Yes, I did say a few weeks ago. Yes, I am a total slacker in taking so long to tell you about our trip. Better late than never?? We went to Playa del Carmen to be exact. It was our first time to Mexico. There were some great things and there were some not-so-great things about our trip. We purchased a LivingSocial Adventure. What’s that you say? Well I’m sure many of you receive the daily email from Groupon and LivingSocial with their deal of the day. The LivingSocial Adventure is a vacation version of a deal of the day. Except it’s not just a vacation it’s a whole trip planned out for you by LivingSocial guides. We didn’t really know all of this when we bought the deal. We thought we were buying a good deal and we would be on our own once we got to Mexico. Not correct. From check in to check out we spent the entire time with the entire group of people that had signed up for the trip, as well as our guides that planned all the events. Some may say “well that sounds terrible.” For us, this was the highlight of the trip. Well maybe not the highlight, but it was one of them. We loved being able to make friends on a vacation. We loved having a group of people to do things with. It was really great. I highly recommend it! Our stay was a small hotel a couple blocks from the beach. It was a decent hotel. Upon check-in they didn’t have a room for us, so we had to be put up in a hotel down the street. Let me just say this other hotel was not even close in comparison with the hotel we were supposed to be at. It was much worse. I was very upset and worried. It is Mexico, you can’t just trust what people tell you, and you can’t just trust any old place without researching it prior. Both of these things we had to trust was going to be ok. The hotel was old, run down and felt more like a hostel than a hotel. It was only for one night and we managed to make it through unharmed, but it was certainly one of the low points of the trip. The next two days were spent doing adventures which were included in our LivingSocial deal. I am typically not an adventurous person, therefore I was quite nervous for these excursions. I put on my brave face and went for it!! We spent the entire morning at a Mayan ranch where in order to start your day you had to rappel down into a cenote (Sa-Note-uh). A cenote is a underground cave. Some are dry and some are wet. The one we spelunked into was wet. We rappelled down and landed in the water. It was SO fun!! On our way into the cave! 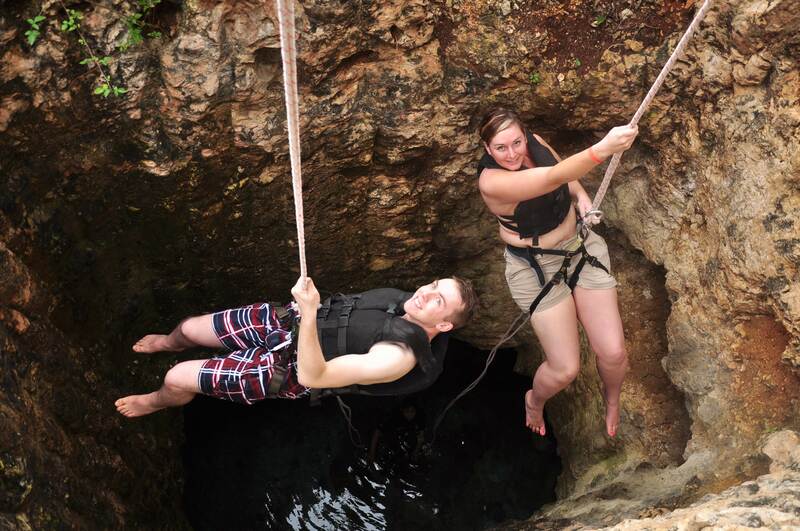 After being purified it was time to do the zip-lining course. I was most terrified of this adventure. I’m fearful of heights and don’t like not being in control. 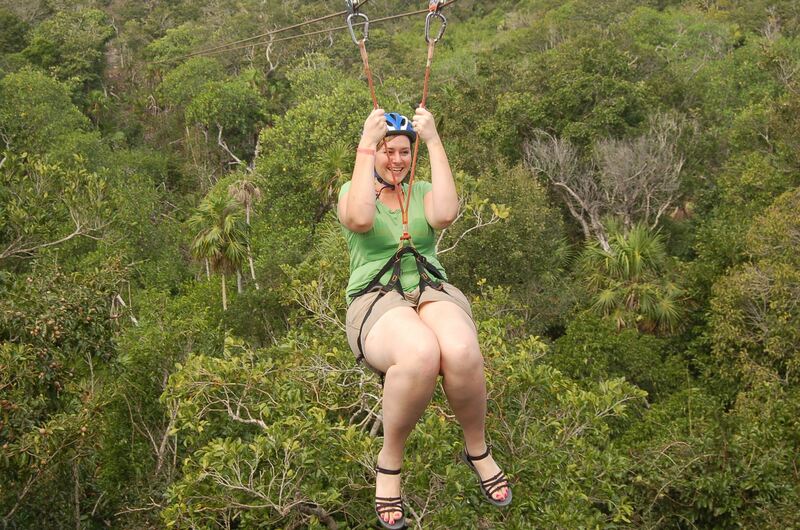 Zip-lining completely faces both of those fears. As I said earlier, though, I was determined. When I saw the tower for the first line I thought “ok, if it was just David and I, I might be able to wuss out, but since we’re around all these other people I can’t look like a fool!” So I went for it. I was scared to death and I looked like a fool but I did it!!! Going backwards on the zip-line! 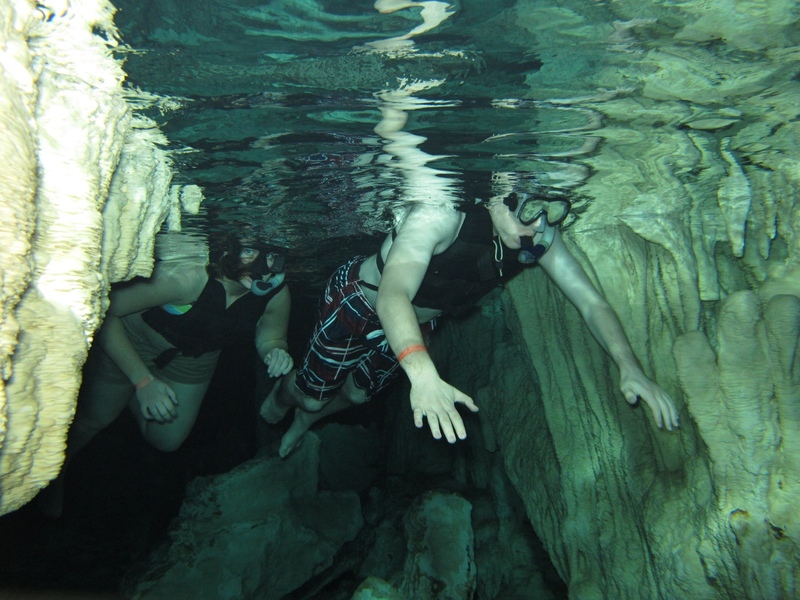 After our zip-lining adventure we wandered over to another wet cenote and did some snorkeling. I had never snorkeled before but was excited to try it. It was so amazing!!! I would definitely do it again. It was a challenge to teach your brain that it’s okay to take a breath while you head is still underwater. 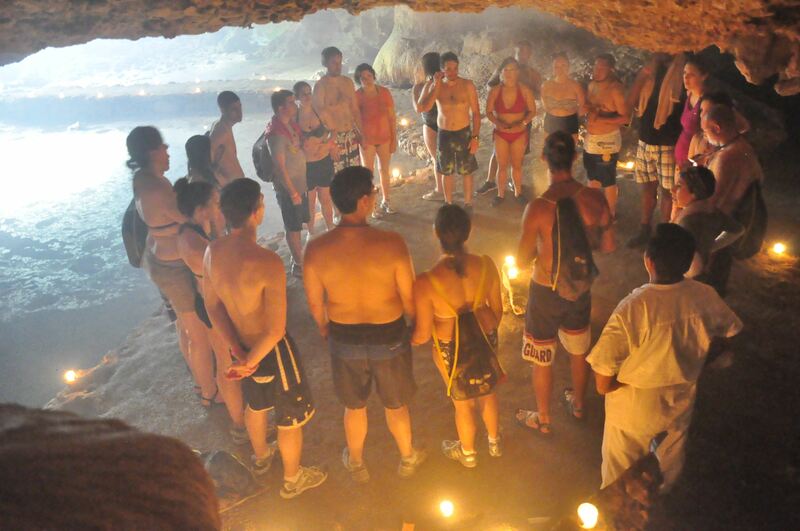 We snorkeled in the caves and fortunately we were there on a day when scuba divers where there as well. They were there doing archeological research. It was a great that they were there because they had giant lights down with them and it lit up the entire floor of the cave, which was tremendously deep. You could see all the spikes and divets coming out of the ground. Really fascinating!! After finishing our snorkel session we headed to a hut and were served a traditional Mayan lunch. Chicken, soup, homemade rice, beans, corn tortillas and lots of amazing salsas. It was delicious and very enjoyable. 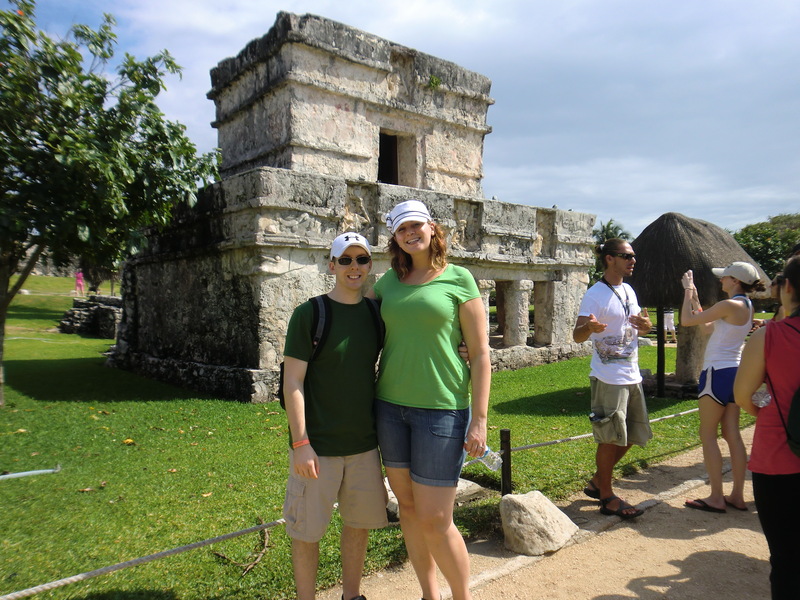 Finally, after finishing our morning at the Mayan ranch, we headed to Tulum to see the Mayan Ruins located there. They were beautiful! They really knew how to pick the most amazing location. 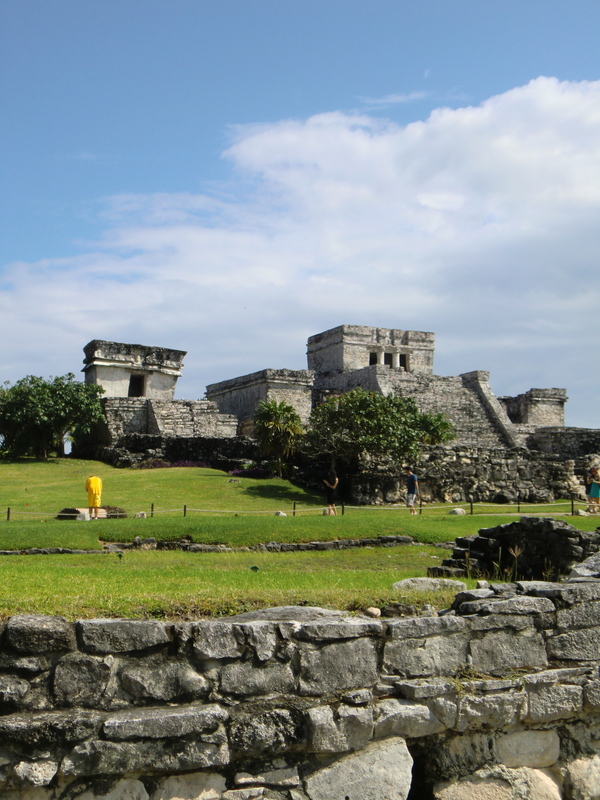 The main temple was literally steps away from a giant cliff that dropped off into the ocean. It was a gorgeous day and the water in Tulum was scenic and peaceful. I wish we could have spent more time there. After returning to our hotel (the correct one this time) we napped, spruced up and then went to dinner at a local off-the-beaten-path restaurant that the LivingSocial guides had arranged for those that wanted to attend. My food was wonderful, the hubby’s food, not so much. Check back tomorrow for the highlights of the remainder of our trip! !